Still in their early teens, Joshua and Noah Austin have yet to reject their mother’s idea of family fun. Chris Austin hauls the family around California to visit canals, dams and reservoirs. They recently made a week’s vacation following irrigation water from the Colorado River near Yuma, Ariz., to farms in the Imperial and Coachella valleys. The boys were good up until the last stop, the stagnant Salton Sea where the farmers dispose their untreated wastewater. Austin, though, can’t seem to get enough on water delivery systems. This is good news for the hundreds of California water professionals and scholars who rely on her to keep up with the latest public meetings, scientific studies and policy initiatives. Austin is the creator of Aquafornia, the most comprehensive daily synthesis of news stories and blogs on California water. For years, she assembled and organized links and summaries of the day’s top water stories and blogs as an independent contractor for the Water Education Foundation of Sacramento, which hosts Aquafornia on its Web site. Austin appeared on the sidebars of news aggregation site under the pen name “Maven,” soliciting news tips and linking viewers to her photo essays of California’s water works, from the Los Angeles Aqueduct (The Austins have explored nearly all 400 miles of it), to the Owens Lake dust dispute with Los Angeles. Today, Austin is charting a new course for “Maven.” After 5 1/2 years of posting other’s stories on Aquafornia, she has moved to producing her own water coverage on her own Web site, Maven’s Notebook. Austin writes even-handed summaries with key quotes from the latest video-recorded water meetings, speeches, scientific reports, blogs and conference presentations. For now, Austin is doing it all on her own time and dime “with the hopes of somehow eventually reaping some economic benefits from it,” as she states in her online profile. Austin carries a booming voice with a loud personality to match. But you wouldn’t know it from her water coverage. Her “agenda” is neutrality, which she sees as a rare and hopefully marketable commodity in covering California water issues. 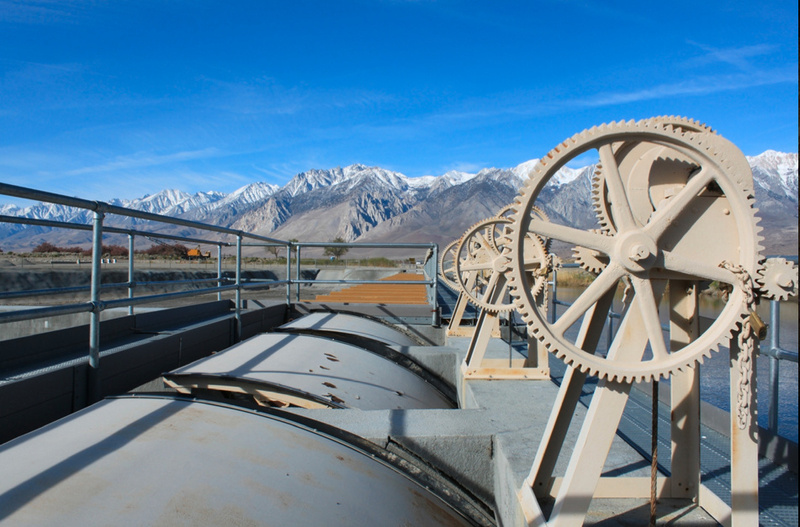 “I’m interested in creating the middle ground for California water – that body of work that advocates neither for nor against any particular project or solution,” Austin said in a recent interview for the California WaterBlog. Her meeting summaries read more like thoughtfully edited transcriptions than news stories. 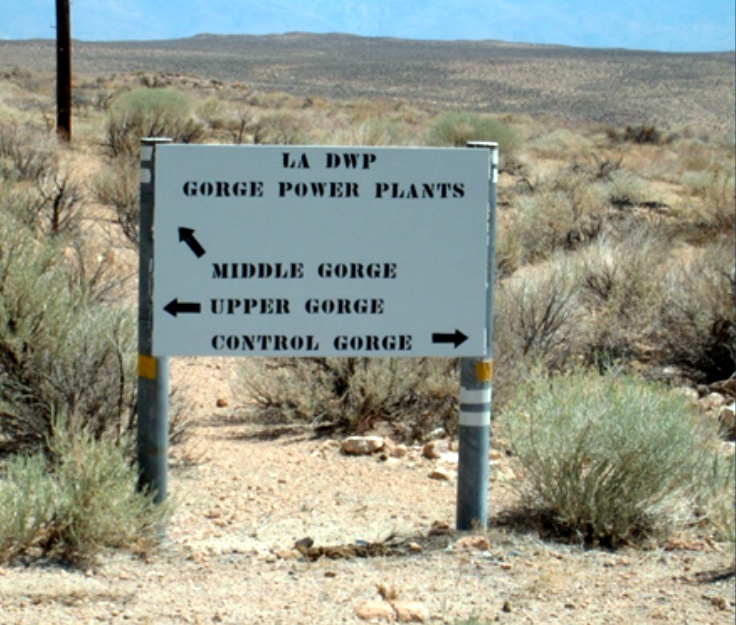 Her roundup of excerpts from water blogs covers a spectrum of views, from the property rights-oriented Pacific Legal Foundation to the environmentalist Natural Resource Defense Council. While reporters for large market media will parachute into meetings promising major decisions or fiery exchanges, Austin keeps watch on the daily turn of events large and small – usually remotely from her desktop computer at home in Santa Clarita. Water officials know that no matter how small the audience or how dry the discussion, their words may show up in Maven’s Minutes. “I think it makes speakers a little bit more accountable,” Austin said. Austin has devoted most of her coverage so far to the council, which posts her summaries of the meetings on its Web site. She also chronicles the development of state’s Bay Delta Conservation Plan, an exhaustive blueprint to restore the estuary’s ecosystem and improve water supply reliability. Most attending these meetings have a vested interest in the outcomes. For Austin, the attraction is in the process. She sees the machinations of California water policymaking as twists and turns on a Rubik’s Cube – the more complex, the more interesting. “I enjoy watching how this is all going to turn out, how we’re going to solve the problem,” she said. There’s nothing apparent in Austin’s background that explains her intense interest in California’s water issues. She grew up in Reno, graduated from a community college and began her career in the recording industry. In the 1990s she worked her way up to operations manager at a North Hollywood studio that recorded many voices for Disney productions. “I was on a first-name basis with Mickey and Minnie Mouse,” she notes on her resume. Austin left the studio business to raise her sons. 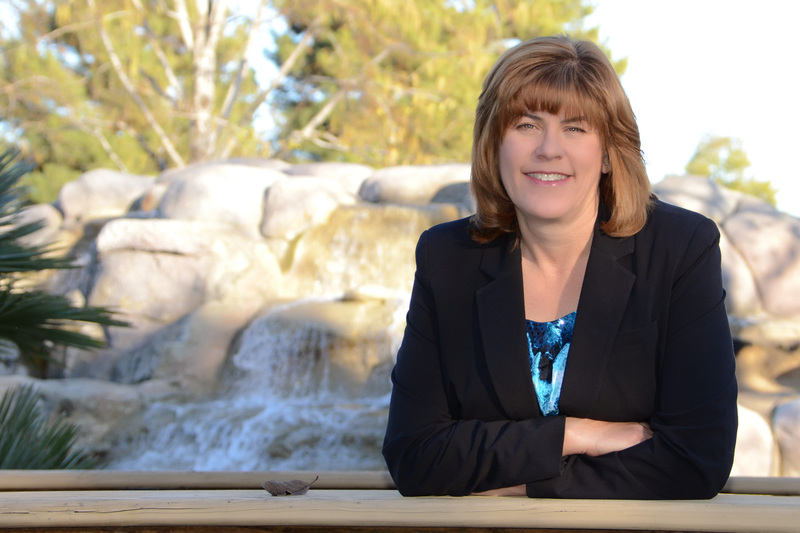 Once they entered school, she became active in online discussions of local politics in the Santa Clarita Valley and began writing stories as a “citizen journalist” for an online community newspaper. A self-assigned piece on the origins of Santa Clarita’s water got her curiosity running wild. She couldn’t find an online aggregator of Southern California water news, so in April 2007 she launched one, naming it “Aquafornia” and identifying herself as “Maven.” About 18 months later, with an average 500 unique visitors daily, the Water Education Foundation took notice. “She had the same kind of editorial mission as we had to be fair and impartial,” said Rita Schmidt Sudman, executive director of the 35-year-old foundation. The foundation hired Austin to produce a statewide version of Aquafornia for its Web site and later bought the domain name. Austin stayed on as an independent contractor until January when foundation staff assumed the news aggregation job. By then, Aquafornia’s daily traffic had doubled to 1,000 unique visitors. Jay Lund, director of the UC Davis Center for Watershed Sciences (which publishes this blog) said Austin’s online creations have proven to be reliable and indispensible sources of water news. “She does more daily service for public and policy understanding of water problems in California than almost anyone else,” Lund wrote in an endorsement on Austin’s LinkedIn page. 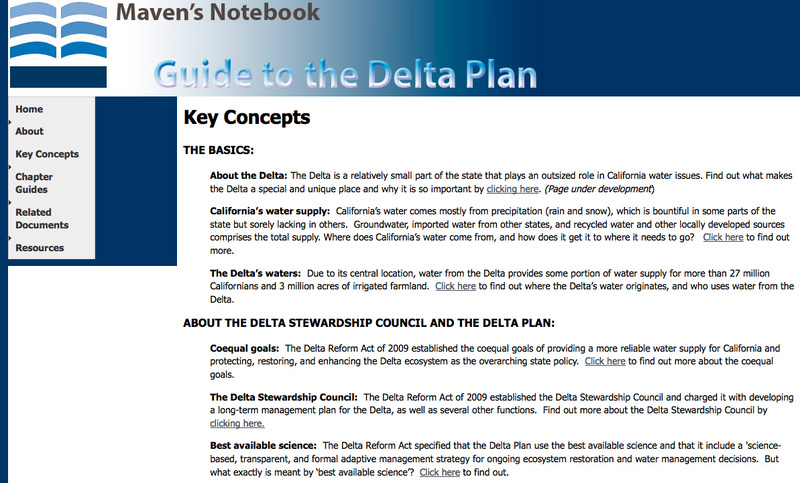 In March 2013, Austin introduced a guide for navigating the complex Delta Plan. Phil Isenberg, chairman of the Delta Stewardship Council, has made the unsolicited effort of introducing Austin to water policymakers for prospective work. 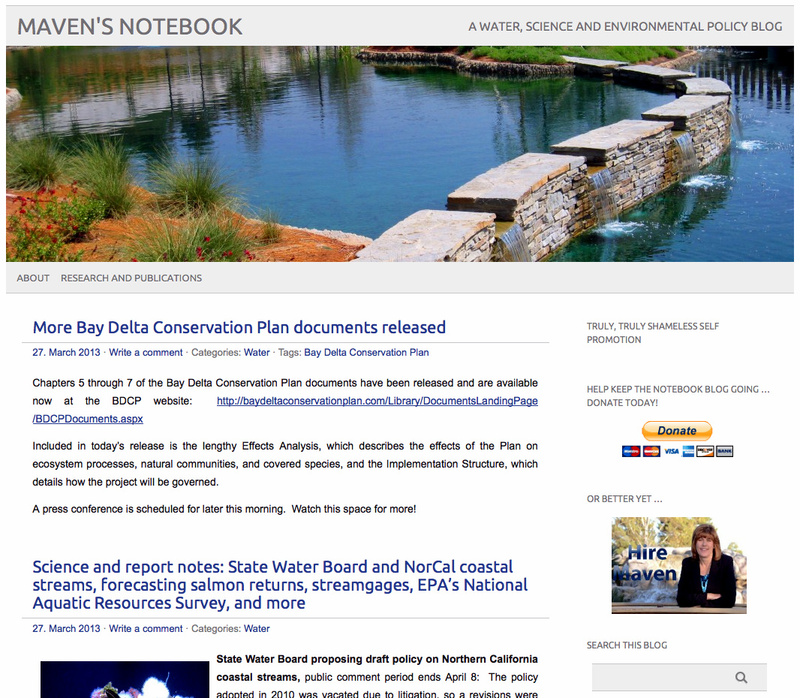 In March Austin picked up a contract with Capitol Weekly, freelancing water stories and introduced a Guide to the Delta Plan on Maven’s Notebook. Austin said she’s looking for funding to do a similar guide to help the public navigate the 17,000-page Bay Delta Conservation Plan. “I need to stay visible,” she said. Chris Bowman is Communications Director at the UC Davis Center for Watershed Sciences. This entry was posted in Uncategorized and tagged Aquafornia, California water, Chris Austin, Chris Bowman. Bookmark the permalink.